When it comes to having a dog pet, it is just like having a baby. There are plenty of things that you should pay attention to: regular grooming, bathing, health check, and so on. Dental care is one of the most important thing that you cannot omit if you have a dog. So besides regular visits for general oral health check, what else can you do at home to keep your dog’s teeth clean and healthy? Brush his teeth, for sure! Brushing your dog’s teeth is one of the most common and simplest ways to maintain his oral hygiene. Just like us, when eating, dogs use their teeth to chew food; thus, food particles are likely to get stuck in the teeth. Without proper brushing and cleaning, after a period of time, bacteria will grow and develop on these food particles, causing bad odor and oral diseases for your little friend. Additionally, brushing your dog’s teeth also helps to remove tartar that may transplant to other body parts and cause blockages if not removed initially in the mouth. Thus, there are many benefits from just brushing your dog’s teeth. So, what do I need for brushing my dog’s teeth? You may think that any toothbrush works the same, as long as it is a brush, it shall do its job – brushing, but in fact, the type of toothbrush matters. If you have a proper toothbrush that suits your dog’s size, you may find brushing his teeth easier. To choose a proper toothbrush, there are several factors such as the dog’s size, gender, and age. His size somewhat determines the size of the toothbrush you shall use. If your dog is small, standard toothbrushes may work just fine. However, if the dog is a big one, you may want to use finger brushes for higher efficiency and convenience. If your dog is medium-sized, it is slightly more difficult to find the most suitable one without trying various different types. So, it really depends on the size of your dogs. Choose handles that are easy for you to hold and control. Brushing your dog’s teeth isn’t just about your dogs. It’s about you as well because you are the one who are doing for him. When browsing for a toothbrush, look for the ones with easy-holding handle. You should choose handles that are easy to move around, especially if your dog is energetic and enjoy moving around a lot. Yes, you need a special toothpaste for dogs. If you are wondering if you can use your toothpaste to brush your dog’s teeth, just to save money and effort of searching for another one for your dog, here is the answer: No. It is not recommended that you use human toothpaste on pets. The reason is that there are many chemicals in our toothpaste such as baking soda and other cleaning agents that are toxic for pets if swallowed. Therefore, spend some time to find one (or you can make one) for your furry friend! Then what should I look for? Finding toothpastes that are suitable for your dogs actually is not as difficult as you think. There are plenty of different dog toothpastes in the market that you can look for. In addition, some toothpastes have food flavors such as poultry or meat that your dog may enjoy. If your dog doesn’t like brushing teeth much, choosing a poultry-flavored toothpaste is strongly recommended to keep your dog excited for the brushing session. However, these meat-flavored toothpastes do not leave a pleasant smell or breath after, so there are other alternatives that you can try such as vanilla flavor or mild mint flavor. These can give your dog a fresher breath compared to the meaty ones. Let your dog try and figure out what he likes most. As there are various of flavors and types of toothpastes in the market, why not let your dog try them out and figure out what he likes most? You can get samples and give them to your dog and see if he likes it. 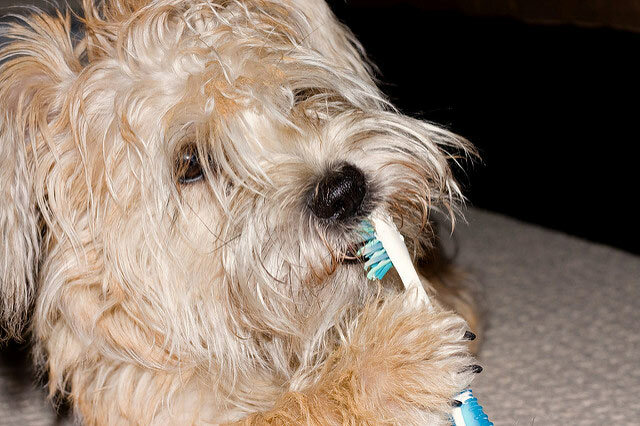 As long as your dog likes it, brushing his teeth can be much easier and more doable. DIY dog toothpaste is one option too. If you are worried about all the chemicals and additives in the commercial toothpastes, you can definitely make your own dog toothpaste with more organic ingredients! The recipes can be easily found online, and it is pretty easy to make a batch of organic toothpaste. Most ingredients are easily found in local markets, so you do not have to worry about finding these ingredients. The most common ingredient is natural oils that are totally safe for your dog if consumed. These oils include coconut oil and olive oil. In addition, you can also use herbs that work as a natural whitener such as turmeric or parsley, which works as an antibacterial agent. Similar to commercial toothpastes, DIY toothpastes can be made with meaty ingredients such as beef cubes to make the toothpastes more appealing to your furry friend. Last few words, don’t forget to give him a regular professional teeth cleaning. Although brushing your dog’s teeth at home not only helps to maintain his oral hygiene but also helps to prevent many dental diseases, it is still recommended that you give him a professional teeth cleaning at least once per year. This is a good time to give him an overall dental check, as well as to get advices from the vets on how to better brush his teeth at home. Sometimes when you brush his teeth at home, you may accidentally damage his gums if you brush the teeth too hard. Thus, a vet visit will give you better idea if you need to adjust the brushing routine. In short, brushing your dog’s teeth does not require more than a good toothbrush and a good tube of toothpaste. Just with some understanding of your dogs, you will be able to find good products for your little friend.